You probably noticed that I haven’t been sharing many photos recently… I wish I could say it was because of work or simply being too busy; but the truth is that I haven’t had the urge to head out with my camera. So to get myself out of this rut I headed somewhere I hadn’t been before — the beautiful County of Wicklow! Before going here I did plenty of research on what locations I wanted to visit, and top of this list was Lough Tay! If you ask the locals, however, they will tell you it’s called The Guinness Lake. 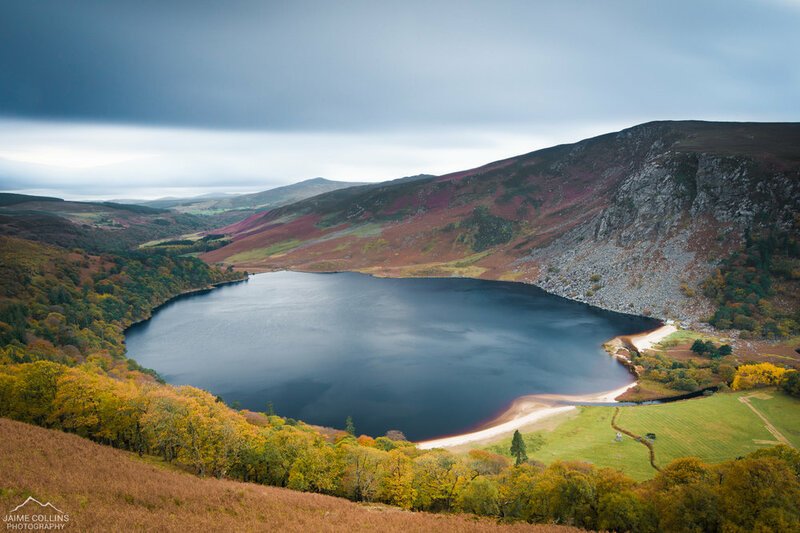 The reason being is that the Guinness family’s estate runs through part of the Lough Tay area. Not only that, but they imported bright white sand and laid it on the northern side to give it the distinctive look of a pint of Guinness! As far as I am aware the lough is considered private property so you cannot visit it. Luckily, however, the best views are by the roadside! I actually visited this location 3 times for sunset before getting the beautifully moody conditions shown below. When it comes to landscape photography, perseverance is key!